I was at a nursery the other day and I discovered a new and very cool summer blooming Spirea. It is called ‘Painted Lady’ and the leaves are variegated white and green! Oddly enough, they told me that in early spring, the leaves look green. It isn’t until they fully develop that they become variegated. I love this plant! Variegated leaves add so much light and excitement. Being a summer blooming type, it will flower in June and July and then you open prune it and cut it back and it will BLOOM AGAIN in September, thru the fall! Deer don’t tend to eat Spireas either. And if you accidentally cut it down in late fall, it will come back up and bloom next year as it flowers on current year’s wood. Easy. When you come for a visit, be sure to check out the variegated rose of Sharon tree in our demonstration gardens. This is a crazy plant. 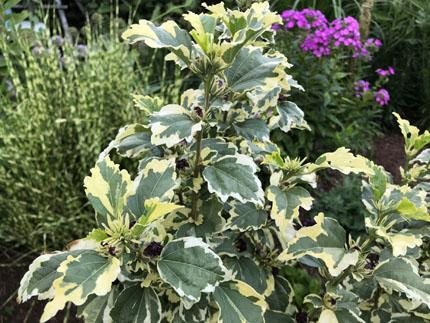 Really bright white and green variegated foliage looks fabulous all throughout the growing season. But the flowers are the crazy part- they look like a dark red double red rose. It turns heads and yes, we have a couple of plants in stock. 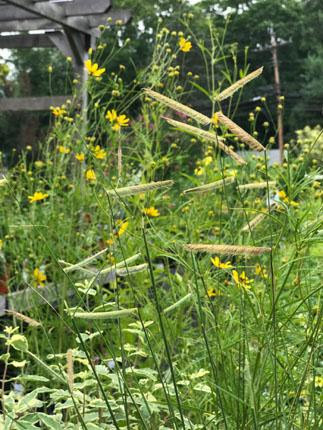 Everyone has been talking about this fun ornamental grass that just arrived. It is called Bouteloua ‘Blonde Ambition’. Check out the funky flower heads, they go from side to side. This has been a real winner in hot, sunny gardens. It only grows 1-2′ tall so it will fit in any garden. Finally, we have just gotten in some really nice white Callunas, summer heathers. Do you know the difference between heath and heather? Spring heath is Erica carnea and it blooms in late February, March, and early April. Heather is Calluna, and it is a summer bloomer. Both like well drained soil and Calluna grows great in full sun. Acid soil? No problem, they actually prefer it. This is Anemone ‘Wild Swan’. It has BLUE on the back of all the flower petals and blooms now. I saw this in England and fell in love. We are total plant geeks and we get in new plants every week. Stop in often, you never know what you will find or what will intrigue you. That’s the fun of gardening, we are always growing and expanding our plant horizons. It is truly an ever-changing, living art form. 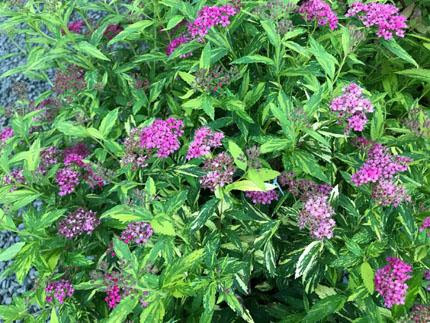 Which Asclepias is right for YOUR Yard? Above is a scene from our demonstration gardens. 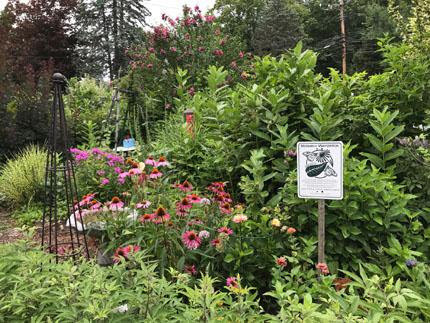 Do you see all those tall, broadleaf plants behind the Monarch Waystation sign? That is common milkweed, Asclepias syriaca. It has taken over this garden! 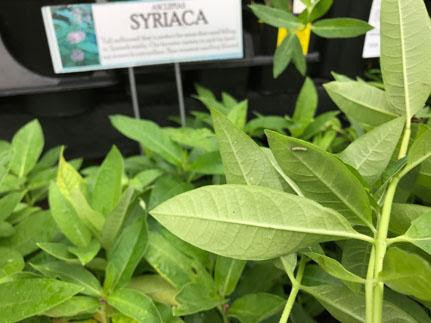 We have really healthy, happy plants of common milkweed in stock and our motto is “If you plant it, they will come” referring to the monarchs. But common milkweed may be a bit too spready for you. Not to worry! Asclepias incarnata is called swamp milkweed but it surely doesn’t need to grow in a swamp or even wet soil. We have it in our borders at Natureworks and we don’t water it. 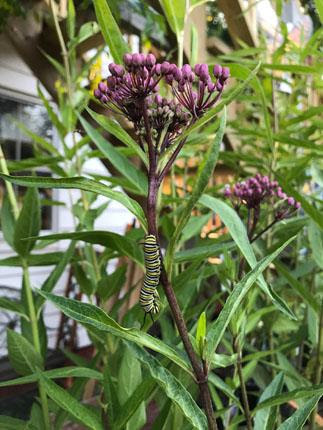 This week a fresh shipment arrived complete with monarch eggs and caterpillars! A bonus! Your options are white or pink, large or small sizes. 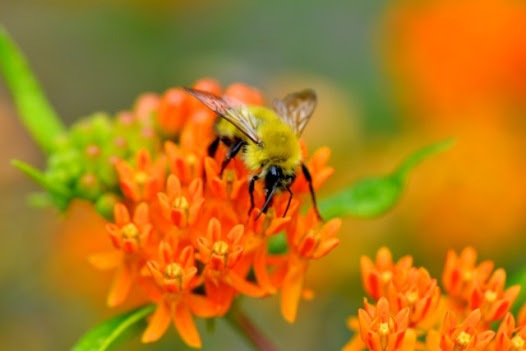 If you have full sun and your soil is well drained, you should grow butterfly weed, Asclepias tuberosa. It has a tuberous (swollen) root and thrives on neglect. 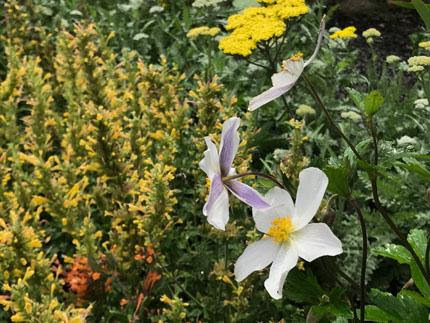 The flowers are orange or golden yellow and it only grows 18-24″ tall. Asclepia tuberosa is called butterfly weed. Besides being a larval food plant for monarch caterpillars, it is an excellent nectar flower for butterflies and pollinators. The foliage on Asclepias verticillata is finely textured. verticillata. This has finely cut leaves and white flowers that start to bloom a bit later than all the rest. 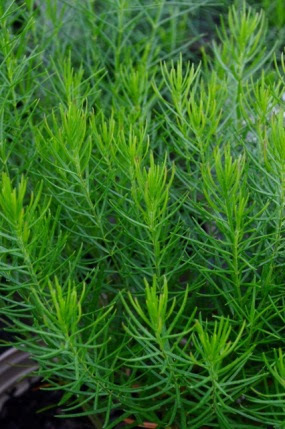 It has a wispy, airy look and weaves beautifully into any sunny garden. We have a wonderful hand lens that even lights up, it’s invaluable for “egg hunting”. My older eyes have a hard time seeing the tiny monarch eggs, even with my reading glasses on. We also have magnifying glasses for kids. They, on the other hand, have NO problem spotting the eggs- they are right at eye level. We also sell all the supplies you need if you want to raise monarchs at home- hatching boxes, mesh cages, water tubes, and wonderful books. Of course, we like nothing better than to show you how to do it and talk monarch raising with you when you come into the store. It’s so magical! 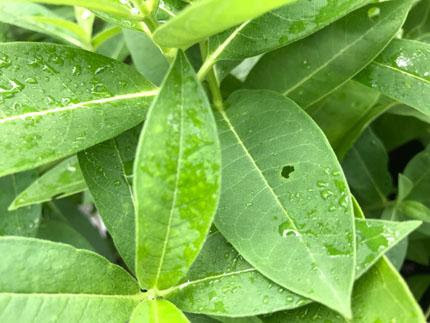 A “D” shaped hole indicates a baby monarch caterpillar has hatched on the leaf and is feeding. Egg hunting means turning over the milkweed leaves and looking for the teeny-tiny eggs. We can help you learn to spot them.